Looking for a Montana Notary? 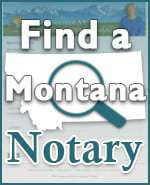 By clicking the Find a Montana Notary icon to the right, you may search for a list of notaries by city or search for a specific notary by name. “Find Notaries in a Specific City” is designed to help people who need notarial services in a specific city find available notaries in that city. This city-search database may not list every notary in the city, as participation in the database listing is voluntary and notaries may opt-out of the database. Only currently commissioned notaries who are able to perform notarial work at their place of business or by appointment are included in this list. “Find a Specific Notary” is designed for those needing to contact a specific notary for information or correction of a notarization previously performed. The database contains the names of over 50,000 current and former Montana notaries, but if you do not find a specific notary you are looking for, please contact the notary staff at [email protected] or by phone at (406) 444-1877 or (406) 444-5379.